Curt Brickman is 57 years old. When I meet him, he’s wearing jeans, hiking shoes and a dark blue jacket. His cap says “Cold War Veteran.” He wears an Army pin in his lapel and sunglasses over his prescription glasses. Ten years in the service, he tells me. Here, I think, is a guy who’s seen a thing or two. A serious adult. Then again, Curt Brickman, when I meet him, is as excited as a kid on Christmas morning. We’re standing in the lobby of the Fargo Jet Center on a clear, warm, calm winter afternoon. For the first time, he’s about to push the throttle in, watch the centerline race, pull back on the yoke and feel the world fall away. He’s decided he wants a pilot’s certificate. This is his Discovery flight. Curt Brickman on his Discovery flight. Justin Gustofson, CFI, meets Curt at the counter. We all shake hands and I promise I’ll be quiet. It would be so easy, I think, to leap into stories. I feel for Curt. My father was a private pilot and I always wanted to fly, but I put off lessons for the same reasons Curt has. I wasn’t going to be a professional pilot, I say. Too expensive. Too this. Too that. I tell Curt that at the end of my first lesson I was angry—angry that I’d given up 30 years of flying time under the banner of being practical. Curt and Justin smile. Justin gives him a tour of the FBO. Pilot’s lounge. Maintenance hangar. Avionics hangar. Flight school. It’s a big and wonderful place. Then the real show starts. Justin gives Curt a headset and we all wander out to a 172. I crawl into the backseat while they go over the visible documents, weight and balance. Curt’s wife, Kelly, watches from the flight school window. Justin is meticulous. More than that, I think. He’s excited. This is a very first flight. There’s a joy in being the student, and there’s a joy in being the teacher, too. They fill the tanks, sump the tanks, check the oil. Hiding in the backseat, what I think I’m watching is a type of liturgy—the careful procession of a revealing truth. They get in and hit every checklist mark slowly and deliberately. When the machine fires up and the nose-wheel strut does that little bounce, I swear, even now, the world is an exciting place. The voice of ATIS: Runways 18 and 27 are in use. Birds in the vicinity. Altimeter 29.38. Curt listens intently, the code opening for him. Curt nods again and I almost laugh. What seems so simple now was indecipherable back then. It was magician-speak, mysterious and thick. Curt pushes the throttle in just a bit and we begin to taxi. Justin has him test the brakes and then we continue, Curt steering with his feet. “Oh, that’s wild!” Curt says. When we rotate, even in the backseat, I can see Curt’s smile. “There ya go,” Justin says. We climb. Justin sets the trim. Flying straight into the wind, we level off and Curt gets comfortable with the controls. We turn to the left and Justin points out the ball for rudder coordination. Curt is a fast learner. We have a 41-knot crosswind and some serious crab to keep on course. Yes, I think. You’ve got it. Or, to be more honest, it’s got you. There’s a serious love for flying. All joy. “Last time I was in an airplane like this, I jumped out,” Curt says. We all laugh. 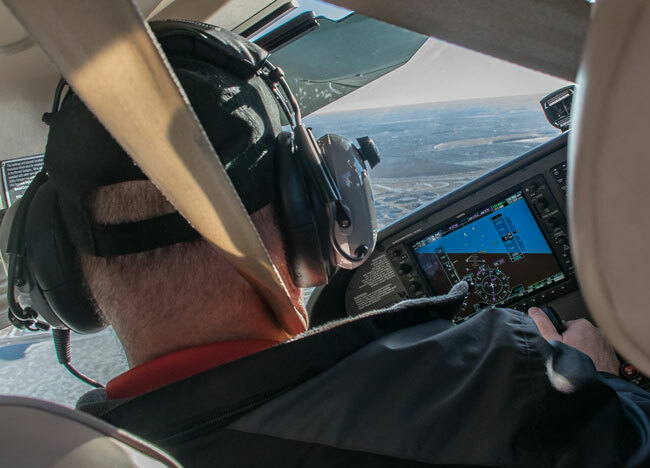 Fifty-seven years old seems late to start a pilot’s training, so I ask him why he’s getting started now. Fargo, North Dakota, is a pretty city on the prairie in mid-winter. The river is frozen and the ice fields glimmer. I doubt Curt notices, though. He’s flying an airplane for the very first time. The deep beauty of the view will come soon enough.